Shale a key investment opportunity but portfolio diversity helps control risk. Calling the energy space under owned and a great value, Frank Holmes and Brian Hicks of U.S. Global Investors view shale oil plays as integral to an energy renaissance. Still, to hedge their bets, the two experts recommend diversification across the entire natural resources sector, including agriculture and food. In this interview with The Energy Report, they list opportunities in upstream oil and gas production, refining stocks, master limited partnerships and potash. The Energy Report: Frank, you wrote a contrarian manifesto of sorts at the beginning of May titled "A Case for Owning Commodities When No One Else Is." It showed that energy is the most underowned class by a long shot. 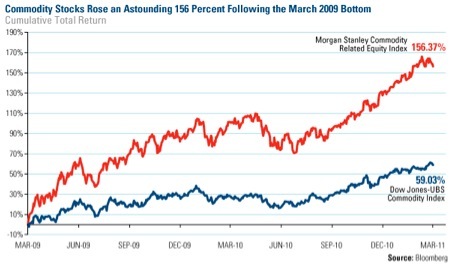 That situation was last seen at the end of 2008, just before a major rally in natural resource stocks. Is history repeating itself? Frank Holmes: To a certain degree, yes. The big difference is that America, thanks to the new introduction of fracking technology, is in a different position than the rest of the world. This is positive for America's trade deficits and its costs of manufacturing. The population of the rest of the world continues to grow. China and India account for about 40% of the world's population growth. Both countries import energy. There is not enough water in China for it to benefit from fracking. Brian Hicks: Water is a very large constraint in fracking, along with other geologic factors. Over the last several years, the game changer has been the development of shale plays here in the U.S. We now import less oil than China because of the amount of shale oil we have. FH: The U.S. has had huge success in drilling and exploring for natural gas, followed by all this gas coming onstream. The inverse of that was when drilling rigs slowed down because gas prices were falling. The rig count went to an all-time low. People do not realize that looking for energy is like being a gerbil on a wheel—you have to drill continuously to replace production. When drilling slowed down to a fraction of what it had been, gas prices went up. What are they now, Brian? BH: They fell as low as $1/thousand cubic feet ($1/Mcf). Now we are in the $4/Mcf range. We had a clear overshoot to the downside. Now we are back to a more normal level. We are in the shoulder months for natural gas. If we see a warm summer, the gas price could easily approach $5/Mcf. Right now, people are in a wait-and-see mode. The natural gas market looks constructive. There is more commercial usage. The rig count is down. If we start to see more demand on the horizon, natural gas prices could go back to $5/Mcf pretty quickly. TER: Do you agree with the Porter Stansberrys of the world, who say the U.S. will be a gas exporter within the next few years, or do you lean toward the Bill Powers' school of thought, that wells will be decimated a lot faster than anticipated and there is no supply glut? BH: I do not think we have a supply glut. We have had a severe oversupply for the last few years, but that has started to change. The change is reflected in rebounding equity prices and a more normal price range for natural gas. In terms of government policy, natural gas is considered a winner, with coal losing market share. Very few North American plays are economic at a price below $4/Mcf. To incentivize more capital investment in natural gas drilling and build a stronger rig count, we need to see prices sustained above $4, closer to $4.50–5. If gas falls below $4/Mcf and stays in that range, the rig count will continue to erode and supply will diminish.